Isaac (Isaak) Yefremovich Boleslavsky was born in Zolotonosha, Ukraine on June 9, 1919. His mother was a noted poet. His father was a pharmacist. His family later moved to Dnipropetrovsk, where Isaac learned chess at the age of 9 in 1928 at the House of Pioneers. In 1933, Boleslavsky won the schoolboy championship of Dnipropetrovsk. In 1936 he took 3rd place in the USSR All-Union Junior Championship, held in Leningrad. In June 1936, Boleslavsky defeated Capablanca in a 30-board simultaneous display held in Dnipropetrovsk. In 1938 he won the Ukraine championship at the age of 19. In 1939 he again won the Ukraine championship and qualified to play in the USSR championship at the age of 20. He gained his chess master title in 1939. In 1940 he played in the 12th USSR championship in Moscow. He won 8 of his last 10 games and tied for 5th-6th. At the end of 1940 he won the Ukraine championship for the 3rd time in a row and attended Sverdlovsk University where he later earned a degree in philology (study of language). In March 1941, he participated in the match-tournament for the title of Absolute Champion of the USSR and took 4th place. He defeated Paul Keres and Andor Lilienthal in matches. When World War II broke out, he did not have to serve in the Army because of weak eyesight. He was evacuated to Sverdlovsk. In November 1942, he took 2nd place, behind Vasily Smyslov, in the Moscow Open, winning 9, drawing 4, losing 2. In 1943 he played in a tournament in Sverdlovsk and took 5th place. That year he got married. He took 3rd in the 13th USSR Championship. In 1945 he took 2nd place in the 14th USSR championship, behind Mikhail Botvinnik. He won 9, drew 6, lost 2. He was awarded the Grandmaster title in the USSR. He played on 3rd board of the USSR-USA radio match. He drew his first game with Fine and defeated him in the 2nd game. He was awarded a prize for the best game of the match. In 1946 his daughter Tatiana was born. She later married David Bronstein, 18 years older than her. In 1946 he made his first international debut in Groningen and tied for 6th-7th with Salo Flohr. In 1947 he took 2nd place in the 15th USSR championship, behind Keres. He won 7 and drew 12 games. 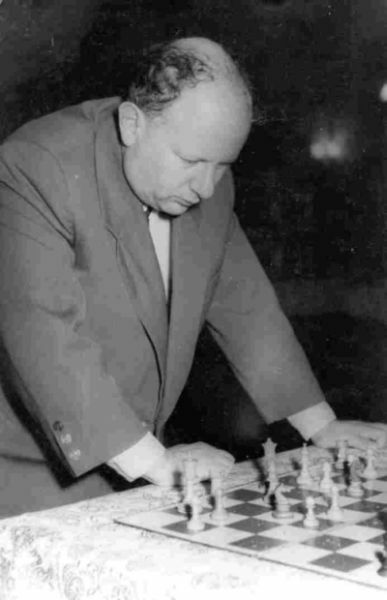 In 1948 he placed 3rd in the Saltsjobaden (Stockholm) interzonal with 6 wins, 12 draws, and 1 loss. The winner was David Bronstein, followed by Szabo. In April 1950 he tied for 1st place with David Bronstein in the Candidates tournament in Budapest (the only undefeated player), but lost the play-off to Bronstein in Moscow. He missed a win in the 13th game that would have advanced Boleslavsky to the world championship match with Botvinnik. In 1950 he was given the International Grandmaster title. In May-June 1951, he tied for 3rd-4th in the semi-finals of the 19th USSR championship, held in Sverdlovsk (behind Tigran Petrosian and Efim Geller). In 1951 he was Bronstein's second against his match with Botvinnik for the world championship. In 1952, he tied for 1st place with Vladimir Saigin at the 18th Belarusian Championship in Minsk. In 1952 he scored 7 out of 8 (6 wins, 2 draws) at the Helsinki Chess Olympiad. He played board 1 Reserve for the USSR team, which took the gold. In Nov-Dec 1952, he tied for 4th-5th in the 20th USSR championship, held in Moscow. Botvinnik and Mark Taimanov shared first place. In Jan-Feb 1953, he took 4th-6th at an international tournament in Bucharest. In 1953 he participated in the Candidates tournament in Zurich. He ended up in 10-11th place. The event was won by Smyslov. In 1954, he took 6th-7th place n the semi-finals of the 22nd USSR championship, held in Gorki. The event was won by Geller. In 1955 his son, Stanilav, was born. In 1955, he took 2nd in the 21st Belarus championship, held in Minsk. The event was won by Suetin. In Nov-Dec 1955, he took 6th-8th in the semi-finals of the 23rd USSR championship, held in Riga. Mikhail Tal won that event. In Jan-Feb 1956, he took 8th place in the 23rd USSR championship, held in Leningrad. Boris Spassky, Mark Taimanov, and Yuri Averbakh tied for 1st. In 1956 he was the second for Smyslov. In 1956, he tied for 1st in the semi-finals of the 24th USSR championship, held in Kharkov. In Jan-Feb 1957, he took 9th place in the 24th USSR championship, held in Moscow. The event was won by Tal. In 1957, he took 2nd in the 23rd Belarus championship (won by Suetin). In 1957 he published "Izbrannye partii" (Selected Games) containing some of his best games. In Nov-Dec 1957, he tied for 3rd-5th in the semi-finals of the 25th USSR championship. Petrosian won the event. In Jan-Feb 1958, he took 9th-11th in the 25th USSR championship, held in Riga. Tal won the event. In 1958, he took 4th-5th in the Kiev championship. In 1959, he took 2nd in the 25th Belarus championship, held in Minsk. Suetin won the event. In 1960, he took 2nd-3rd in the semi-finals of the 28th USSR championship, held in Rostov on Don. Spassky won the event. In 1960, he took 2nd in the 26th Belarus championship, held in Vitebsk. The event was won by Alexei Suetin. In Jan-Feb 1961, he played in his last USSR championship. He took 12th-13th in the 28th USSR championship, held in Moscow. Petrosian won the event. In July 1961, He tied for 1st place at an international tournament in Debrecen, Hungary (4th Asztalos Memorial). In 1961, he took 2nd in the 27th Belarus championship, held in Minsk. Again, Suetin won the event. In 1962 he was the second for all 5 Soviet representatives at the Curacao candidates tournament. He was world champion Tigran Petrosian's 2nd from 1963 to 1969. In 1963-64, he took 2nd at an international tournament in Stockholm. Smyslov won the event. In 1964, he won the 30th Belarusian Championship. In 1965, he won the 30th Uzbekistan championship. In 1968 he captained the USSR students' team championship which won the world championship at Ybbs. In 1968, he took 3rd in the 34th Belarus championship. His last tournament appearance was in Minsk in 1971. He was 52. He died in Minsk on Feb 15, 1977 at the age of 57, after falling on an icy sidewalk, fracturing his hip and contracting a fatal infection while recovering in a hospital. He is buried in Minsk a few yards away from his best friend and son-in-law, David Bronstein. The moves 1.e4 c5 2.Nf3 Nc6 3.d4 cxd4 4.Nxd4 Nf6 5.Nc3 d6 6.Be2 e5 is known as the Boleslavsky variation. Boleslavsky played in 11 USSR championships. He was chess coach of the USSR Chess Olympiad team from 1958 to 1970. The team won a gold medal every time they participated in the chess Olympiad.